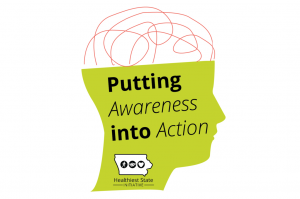 The Iowa Governor’s Conference on Public Health is a must-attend event for all Iowans who work in public health, environmental health, primary care, health promotion, health education and laboratory sciences. Conference attendees receive profession-specific knowledge, as well as, exposure to other disciplines within public health. 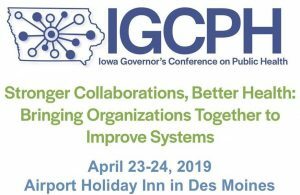 You will hear from national, state and local experts in public health, have the chance to network with state and local partners, and reconnect with friends and colleagues as you attend the keynote speakers, concurrent sessions, poster presentations, exhibits and association meetings. Finding the right talent for any organization is a critical element in an organization’s overarching strategy for long-term success. There are recognized workplace policies and practices that can heighten an organization’s ability to reach and draw from the largely untapped talent pool of individuals with disabilities. In this webinar, we provide an overview of how organizations can expand their potential talent pool to reach this population, by shaping a more disability inclusive recruitment and hiring process. To identify specific internal HR policies and practices that facilitate effective recruitment and hiring of individuals with disabilities. Think about how to use internal organizational and external community resources to maximize access to a pipeline of qualified candidates with disabilities. Consider how to design interview processes that minimize disability discrimination and maximize equal opportunity for consideration of candidates with disabilities. Organizations with internship programs for individuals with disabilities are six times more likely to have successfully hired a person with a disability in the past year. Organizations with strong senior management commitment to hiring of people with disabilities are five times more likely to have successfully hired a person with a disability in the past year. Actively recruiting people with disabilities, having explicit disability hiring goals, disability in the diversity and inclusion statement, and partnerships with community organizations, are all practices that heighten by 3 to 4 times the likelihood that an organization will have successfully hired a person with a disability in the past year. Visit WWPDI.org to register for this free webinar. 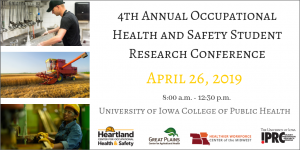 The 4th Annual Occupational Health & Safety Student Research Conference will take place at the University of Iowa College of Public Health (145 N. Riverside Drive, Iowa City) on Friday, April 26. This event provides an opportunity for students, faculty, and collaborators across campus and the region to learn about innovative occupational health and safety research being conducted by students, and gives students an opportunity to showcase their research in this important field. The half-day conference (8:00 a.m. – 12:30 p.m. in N110 & the Atrium) will feature poster presentations and 3-minute research presentations by students.Students: Learn more about submission guidelines and submit here. The keynote speaker will be Dr. Darrin Ott, Core Technical Competency Lead of Air Force Research Labs, Wright-Patterson Air Force Base, Dayton, OH. 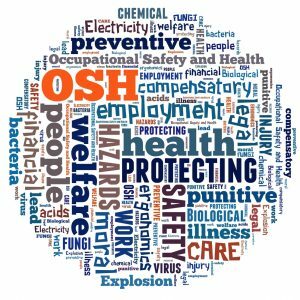 The 2019 American Occupational Health Conference (AOHC) is ACOEM’s 104th Annual Meeting. AOHC serves two fundamental purposes: it is the premier professional meeting for physicians and other health professionals who have an interest in the fields of occupational and environmental medicine (OEM); and it is the annual membership meeting for ACOEM’s members. We are running around saying that we are ‘so busy’ and ‘stressed out’. Workloads are overwhelming and we feel like drowning in a sea of hindering work tasks. But there are times that we feel like we are up to the challenge of the next project. We look for ways to make our job more interesting and inspiring and we jump at the opportunity of taking on more responsibility or joining a new team. Those are exciting situations, ‘challenge stressors’, that signal for us that there is an opportunity to learn and grow. This webinar will describe the basics of the stress experience, and explain how can we set up workplaces to promote challenges and minimize hindrances. ​​How sources of stress in the workplace can be perceived as irrelevant, positive or stressful stressors. How workplace demands can be challenging stressors that provide us with opportunities to grow, or hindering stressors that threaten our growth, leading to different job attitudes and performance levels. When we perceive stressors as opportunities to grow, we feel more committed to our organizations. Feeling supported and valued by our organizations can help us see job responsibilities as opportunities to learn and grow. Organizational resources are essential to promote a healthy workplace where employees can grow and flourish. Dr. Christa Singleton, Centers for Disease Control, will speak on their 6|18 Initiative. 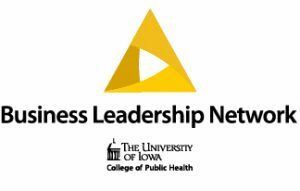 Al Lewis, CEO of Quizzify, will give an interactive presentation on health literacy and how it impacts an employer’s bottom line. 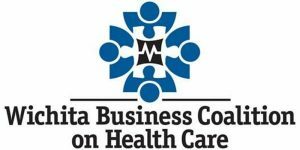 Lauren Vela, Senior Director of Member Value at the Pacific Business Group on Health, will speak on projects to reduce waste in formularies and medical care. Dr. Justin Moore, WBCHC Medical Director, will present on the issue of social isolation. Vicki Schmidt, newly elected Kansas Insurance Commissioner, will speak on her vision and plans for the commission as it relates to health care and benefit design. Sponsorship and vendor opportunities are available. For more information about those opportunities, or about the event, please contact Shelley Duncan (ShelleyDuncan@cphcp.com) or Matt Thibault (MattThibault@med-soc.org). We have pending CEUs for Insurance and HR. Nursing CEUs: Ascension Via Christi Hospitals in Wichita are approved as a provider of continuing nursing education by the Kansas State Board of Nursing. This course offering is approved for 6.0 contact hours applicable for RN, LPN and LMHT re-licensure. Kansas State Board of Nursing approved Provider Number: LT: 0062-0738. The 2019 NORA Symposium will feature a panel discussion about the challenges of addressing stress and mental health problems that result from work. Hear perspectives from panelists representing agricultural producers, firefighters and veterinarians. Forums draw a cross-section of business owners and managers, economic development leaders, public health officials and health care providers, local elected officials, a variety of agency and organization representatives, and the general public. Check out this video and read summaries below of past events to learn more about the community forums. Low-cost strategies for employers to implement in the workplace to keep their employees healthy and productive. Inspiring kids to lead healthy lives through eating right, staying active, and setting goals. For more information and to RSVP: Register Here. 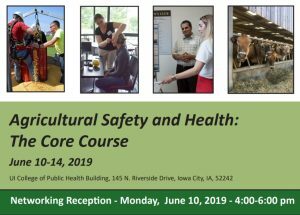 The Agricultural Safety and Health Core Course has been the national model of effective agricultural safety and health education for over a decade. Expert instruction is provided by experienced faculty and specialists including Board Certified Physicians, Veterinarians, and Certified Industrial Hygienists.